I’m a thirty-something working mama of a sassy 3 year old who discovered her love of running in 2014. What started out as just trying to complete a 5K turned into finishing my first half marathon last October. I’ve since run several other races and a second half marathon. I’m tackling the Baltimore Half again this fall. 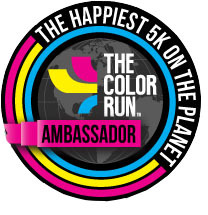 I’m a Color Run Ambassador, a Girls Gone Sporty Ambassador, and most recently, a Sweat Pink Ambassador! I love running, being a mom, the Baltimore Ravens, pizza, cupcakes, beer, and wine. I started this blog to document the ups and downs of training, running, and fitness in general. What I didn’t expect to find what the supportive running / blogging community that came with it. So thankful to have started this journey! Won’t you come run with me? Hey! I nominated you for a ‘very inspiring blogger’ award 🙂 Check it out here … basically it gives you the chance to talk about yourself and link up with others. Hi, just found you via the Very Inspiring Blogger award. Welcome! I fairly new to running and VERY new to blogging. It’s been nice to find new blogs to follow and interact with fellow runners in a new way. Have a great weekend! Have a great weekend also. My Sunday Long Runs begin this weekend! 13 miles. I think up to it, but it will probably be hot. Hey there! I have a quick question about your blog. Could you please email me when you get a chance? Thanks! !